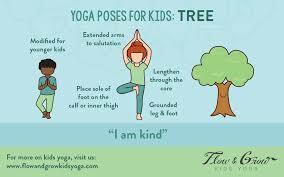 Vrksasana teaches your kid the grace of a tree, standing tall and maintaining balance. Begin the posture with the mountain pose, wherein the legs are straight, hands at the sides, back straight, and thigh muscles firm. Lift the right foot, with the knee out. Place the right foot on the left inner thigh in a position where it feels comfortable. Press the hands together above the head. Gaze at a particular point about 5 feet away. Hold the position for 30 seconds to a minute. Return the hands to the chest and then lower the right leg. Repeat it on the left leg. Caution: If your kid gets unsteady in the beginning while trying to hold their posture, you may make them stand with their back against a wall. This rejuvenating backbend gives a great stretch to the spine and thighs. Bend the knees a little and keep the feet flat on the floor, hip-width apart. The knees and ankles must be in a straight line. Place the arms in a resting position beside the body with the palms downwards. Take a deep breath and lift the lower, middle and upper back off the floor. Balance the body in a way that the arms, shoulders, and feet support the body weight. Have the fingers interlaced and hands pushed to the ground to help lift the torso higher. Let your child hold this posture for as long as they are comfortable while breathing slowly. Caution: If your kid faces difficulty in making the pelvis lift from the floor, slide a sturdy bolster under their sacrum to rest their pelvis. In case of any neck or shoulder pain, take assistance from a professional to hone the steps. The word ‘yoga’ comes from the Sanskrit word “yuj”, which means ‘to the union’, ‘to yoke’ or ‘to add’. Yoga aims to unite the egoistic self with the divine self, or in other words to achieve mastery over the mind and body. It is not a religion but a philosophy. Yoga aims to keep the body and mind fit so that it propels spiritual well-being. There are different styles of yoga, including body postures, breathing exercises and meditation. Each branch of yoga represents a unique approach to life and has its own specific characteristics. A child doesn’t require yoga skills to start off. They just have to start and yoga will become a way of their life. It keeps them active, balances their body, mind, and soul, and helps them focus on their life. Momjunction helps you introduce yoga to your children, as we tell you about the practice, and share instructions for some simple yogasanas (yoga poses) to begin with. Six months of yoga, including meditation, asanas, and pranayama (breathing exercises), have shown to reduce body weight, improve endocrine functions and memory. Yoga has innumerable benefits. Let your kid start with the basic poses and realize their benefits. The perfect stretch promotes a sturdy back, abs and strength. Lie face down with the tips of the feet flat on the floor and palms on either side of the body. Pull the shoulders slightly back towards the spine. Engage the abdomen throughout the exercise as it keeps the lower back protected. Lift the body into a cobra pose while keeping the chin up. Use the hands for support, but without putting unnecessary pressure. Hold the posture for 15 to 30 seconds, before gently releasing the body to the floor. This is a good morning yoga for kids to practice daily. Caution: Ask your kid to arch the back as much as the body can take. Every child has different flexibility, so let them take it slow. Surya Namaskar is not included in typical yoga. It is the religious practice of worshiping God Sun with Mantra chanting. You can do yoga many times a day. There is no side effects of SUn ssalutaion.